Job placement rate (in a role requiring a graduate nursing degree) 6-12 months post-graduation was 86%. 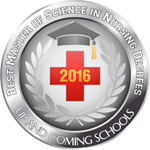 Based on survey data for more online course offerings, the graduate nursing program transitioned to an online format in spring 2016. Program satisfaction is measured 6-12 months post-graduation. 100% of the 2016 alumni indicated that they were very satisfied with the program 6-12 months post-graduation. This data is based on a survey response rate of 25%.